If you’re a driver in or around Radcliff, KY, in the market for a new vehicle, we welcome you to peruse the options at our Clarksville, IN, Mitsubishi dealership. We have a wide variety of both used and new Mitsubishi cars for sale, such as the 2018 Mitsubishi Outlander. If you’re looking for a model with three rows of seating and plenty of standard features, ask our Mitsubishi dealers to introduce you to this three-row crossover. The 2018 Mitsubishi Outlander is a vehicle that has your family in mind. If you value efficiency, affordability, and room for you and your loved ones, you’ll find all of that in this model. 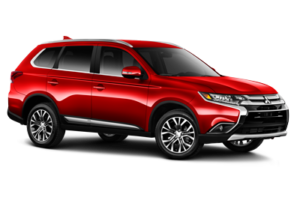 This seven-passenger vehicle is available in five various trim levels, starting with the entry-level Mitsubishi Outlander ES — powered by a 2.4-liter, four-cylinder engine that is paired with a continuously variable engine and capable of producing 166 horsepower. The range-topping Mitsubishi Outlander GT trim diverges from the rest of the lineup with a different powertrain: a 3.0-liter V6 engine along with a six-speed automatic transmission that earns 224 horsepower. Overall, the 2018 Mitsubishi Outlander provides easy and comfortable daily driving, perfect for running errands, commuting, and school drop-offs. If you do find yourself heading for some trails during the weekend, you can trust this crossover to be up to the task. If you’d like to take a spin in this model, schedule a test drive with your local Indiana Mitsubishi dealers. The base Mitsubishi Outlander ES comes with a number of in-demand features. Dual-zone climate control, a second-row seat that slides and reclines, and a 50/50 split-folding, third-row seat allow for flexibility and comfort. Onboard technology for connectivity and safety include a rearview camera, Bluetooth® and USB connectivity, and voice controls. Stepping up a few trims to the Mitsubishi Outlander SEL affords you more safety and convenience with additional safety aids like blind-spot monitoring, rear cross-traffic alert, and automatic headlights and wipers. You’ll also gain Apple CarPlay™ and Android Auto™ smartphone integration along with upgrades like leather upholstery and a power liftgate. Ask your Mitsubishi dealers near Louisville, KY, for a full rundown of all the stand-alone options and packages. If you’re interested in purchasing the 2018 Mitsubishi Outlander, we welcome your visit to Mitsubishi Store Clarksville. When you’re here, we’ll be happy to guide you through a test drive as well as trim level and financing options.